Do you see it?! Much Mahalo Matt! Do you see it?! Much Mahalo to our good friend Matt who's always representing the our badge at events or to where ever the road leads him. This time, Matt was fortunate to get an article in the Honolulu Street Pulse magazine along with his built 86 Toyota Corolla. We go way back with Matt, from his famous FF and FR drift tandem runs at Drift Session to his 56757765 cars that he owned...lol...just kidding bro! Thanks again for flashing the badge bro! Honolulu Street Pulse Magazine "The Connoisseur of Cars". Photos by Ryzo and Ryan R.
The crew representing at the Supremacy Hawaii Car Club 14th Annual Food Drive and Spring Break Show N' Shine! 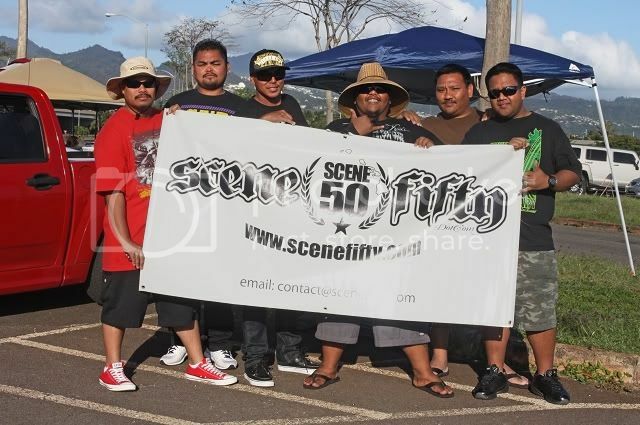 Much Mahalo to the crew over at Supremacy Hawaii Car Club for letting us sponsor your events! Aloha!